This was the flyer for the launch of Manchester Digital (then District) Music Archive in 2004. Our organisation formed the previous year, but this was our first big public event. 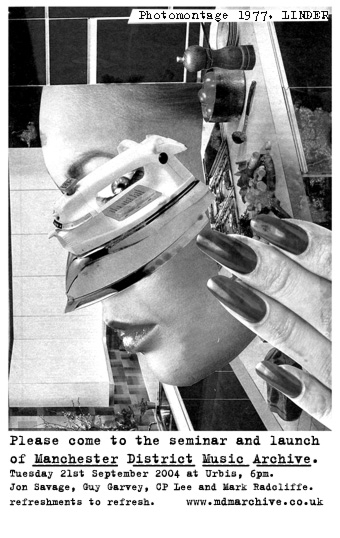 We contacted Linder Sterling to ask if we could use one of her photomontages for our flyer. The image had appeared on a Buzzcocks flyer for a Rafters gig in 1977. She kindly agreed. The launch was at Urbis as part of the 2004 In The City convention. It was attended by over 300 people and led by a panel including Mark Radcliffe, Jan Hargreaves, Jon Savage and Guy Garvey. The launch was covered by Radio 1, Radio 4, The Independent, NME, MEN and GMR.